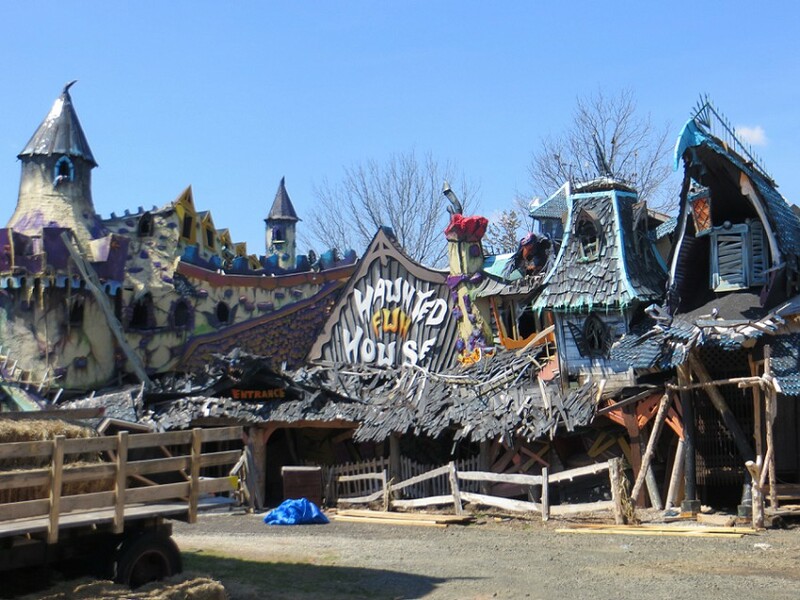 August 18, 2014 — Wild Bill’s Nostalgia Center in Middleton, Connecticut, is a shop that really wears its heart on its shingles. 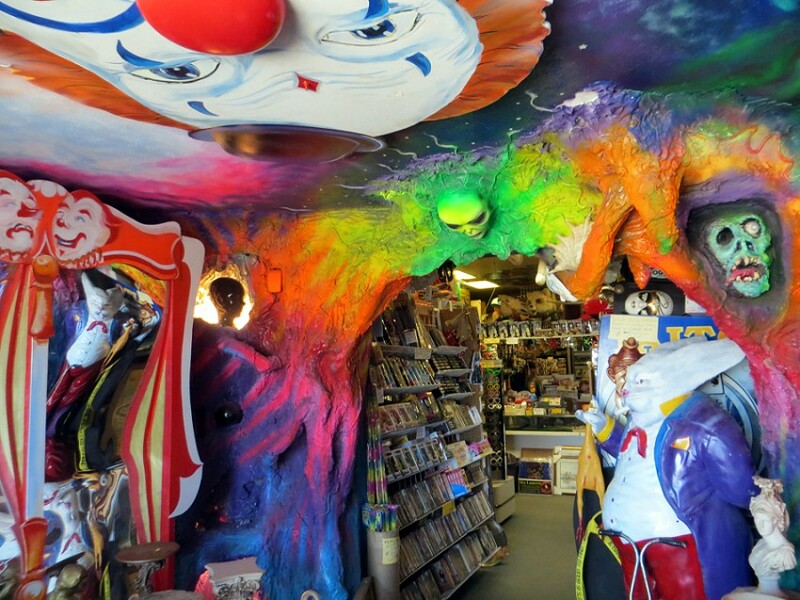 Every square inch of its exterior is painted with musicians, monsters, clowns, animals, Native American symbols, and other things, all against a trippy, hippie rainbow backdrop. The whole thing looks like the garage where you park all those painted vans that I’m not even sure people have anymore…but should. 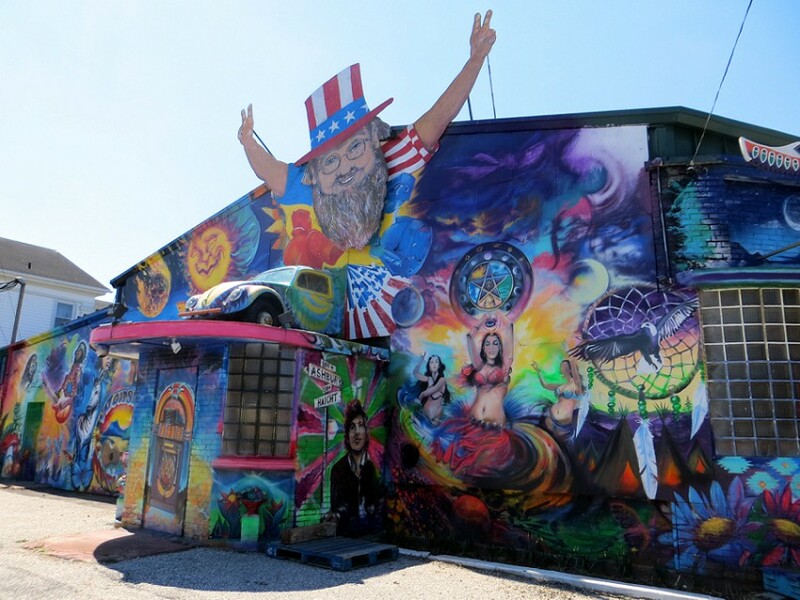 The heart belongs to “Wild” Bill Ziegler, who is represented on the façade in a long gray beard, round-lensed spectacles, and an Uncle Sam hat throwing up peace signs above am image of Rock ’em Sock ’em Robots and an actual VW bug placed over the entrance. But what if I told you that, when we pulled into the parking lot, this bright, psychedelic building wasn’t even the first thing that pulled our eyeballs from our heads. That would be the adjacent brick silo with the giant clown head atop it that reminded me of that scene near the end of The Muppet Movie where the head of a giant Animal hopped up on insta-grow pills bursts through the top of a building. Billed as the world’s largest jack-in-the-box (since the head retracts into the silo), it’s actually more notable for its connection to Captain Kangaroo, the children show host of yore. 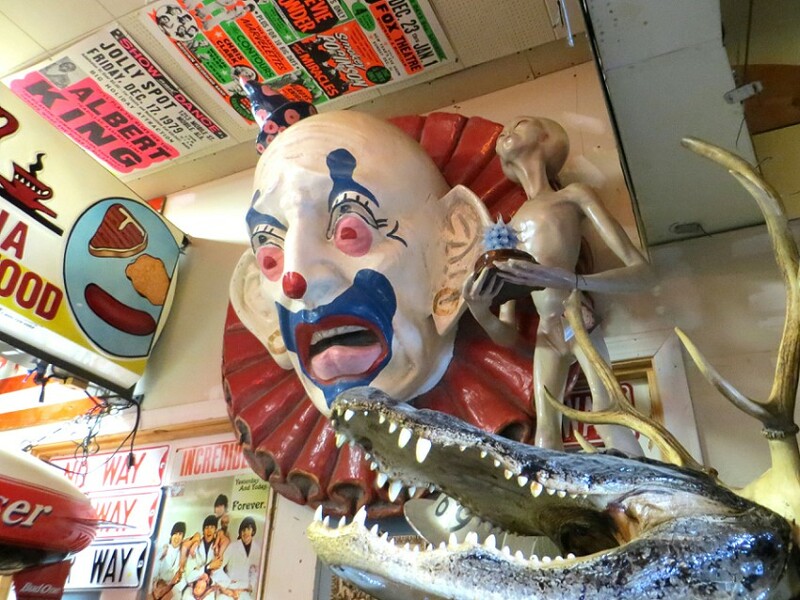 The giant clown head is modeled after Clarabell the Clown, a sidekick of Howdy Doody on the Howdy Doody Show from the 1950s. It was built for one of the guys who played Clarabell, Bob Keeshan, who would later go on to don the red jacket and Romulan haircut of Captain Kangaroo. 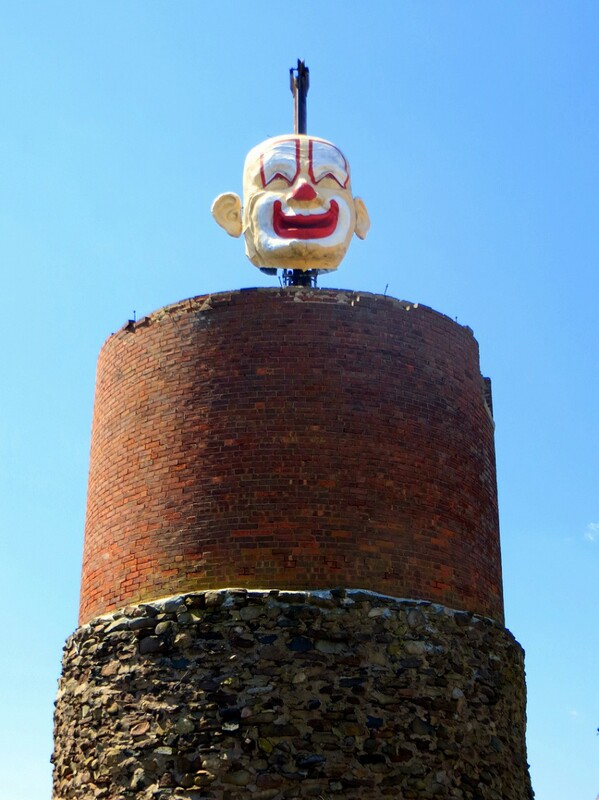 Ziegler got his hands on it and decided to stick it atop a tower, because giant clown heads should be shared. 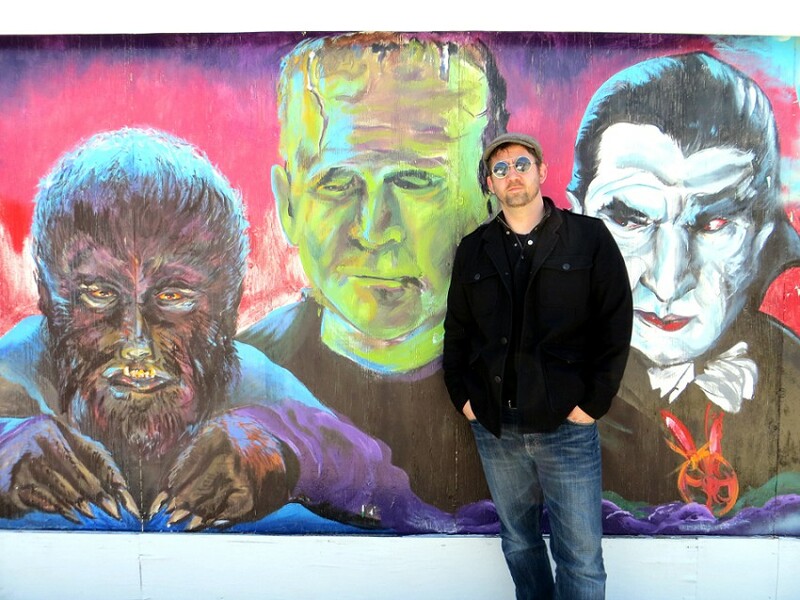 On the far side of Clarabell was another amazing sight: a massive carnival-style haunted house. 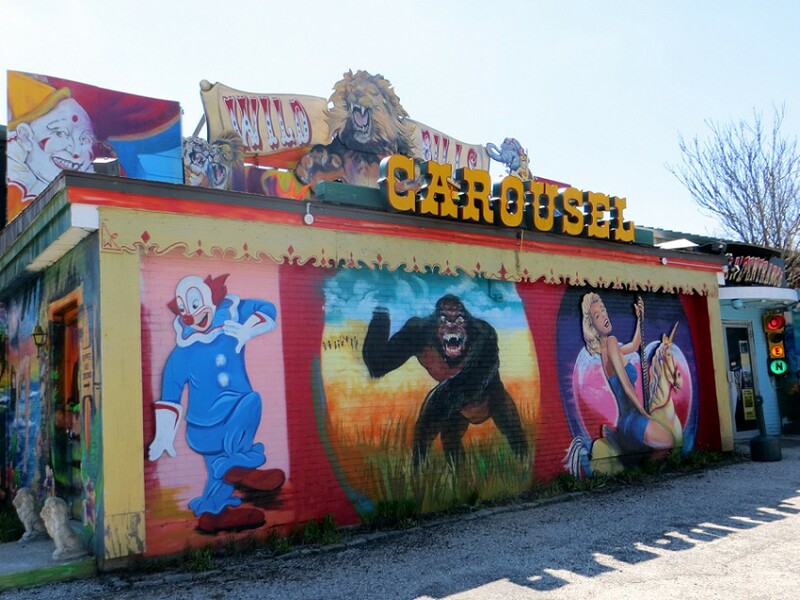 It’s not open to the public yet, and it’s been under construction for years, but according to the website, they’re aiming to make it the world’s longest walk-through funhouse in the world, thus solving my biggest problem with haunts…too short. I want them to go so long that despair settles into my soul. That’s always my bar for success in anything. Eventually, we remembered that we weren’t supposed to just gawp at the wonders in the parking lot and entered Wild Bill’s itself. The inside of the place definitely matches the outside. The space is sizeable, but has been shrunken like an artery full of cholesterol into narrow paths crammed on both sides and above with a range of things that I can only assume are pieces of Ziegler’s soul. We saw Ziegler immediately, manning the cash register as he has for 30 years, half of which at a previous location before he bought this ex-nightclub in 1999 and hippified it. His gray beard and matching hair were much longer than the caricature of him out front, he was a bit thinner, and he wasn’t wearing an Uncle Sam hat. We didn’t talk to him on entering, as he was busy with other customers, so we took off into the belly of the store. Now, when he calls this a nostalgia center, he mean everybody’s nostalgia. 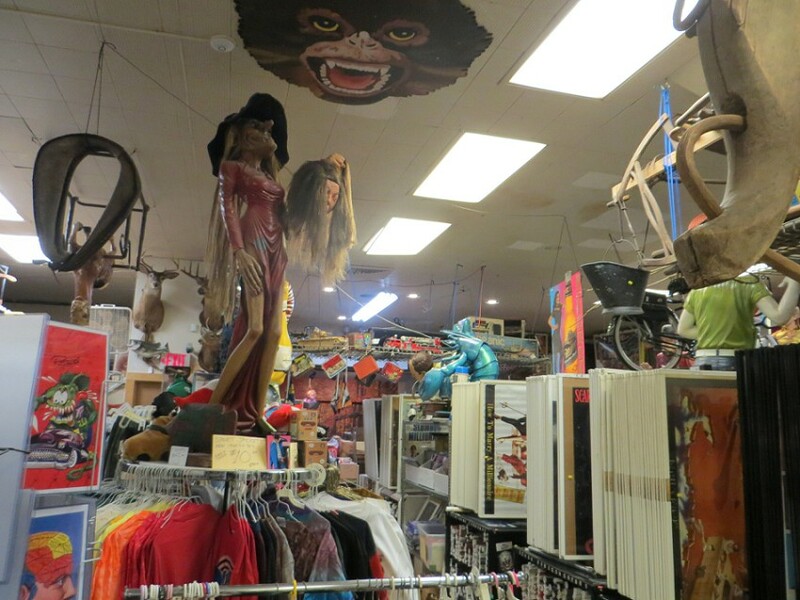 I saw VHS tapes, vinyl records, posters, toys, animal bones, jewelry, clothes and pop culture relics of all sorts from all decades jumbled on top of jumbles and dangling from the ceiling with no real theme other than “Bill bought it.” Most of it was for sale, and the stuff he obviously didn’t want to part with was priced exorbitantly. The best part about the store was the feel of it. It felt authentic. In a day and age where eBay has it all and you can buy replicas of anything online and everything has been reissued and mass marketed in new forms to the point where nostalgia ain’t what it used to be, this felt like the artifacts of a man’s life who experienced most of the decades represented and has the proof in piles around him…even if he bought most of it in bulk. While we were standing there, a tall, older guy with close-cropped, faded blond hair and an extremely confident stance walked in, He talked to Ziegler for a bit, and then just kind of hung out surveying the place. I know he did all this because I was staring at him. There was something familiar about him to me, but he left before I could figure out why. Later, when we were checking out (because of course we bought stuff), we spent some time talking to Ziegler, or at least my four-year-old did, as the two really hit it off. Ziegler mentioned to me that the guy that had attracted my attention was Bob Backlund, the professional wrestler, a friend of his that lives nearby and drops by every so often. That’s where I’d seen him, on the WWF back when it was called the WWF during one if its runs (like right now I think) where it seeped into pop culture deep enough that you didn’t have to watch it to know about it. I didn’t recognize him because he wasn’t naked and angry or, alternatively, wearing his Pee-Wee Herman outfit. 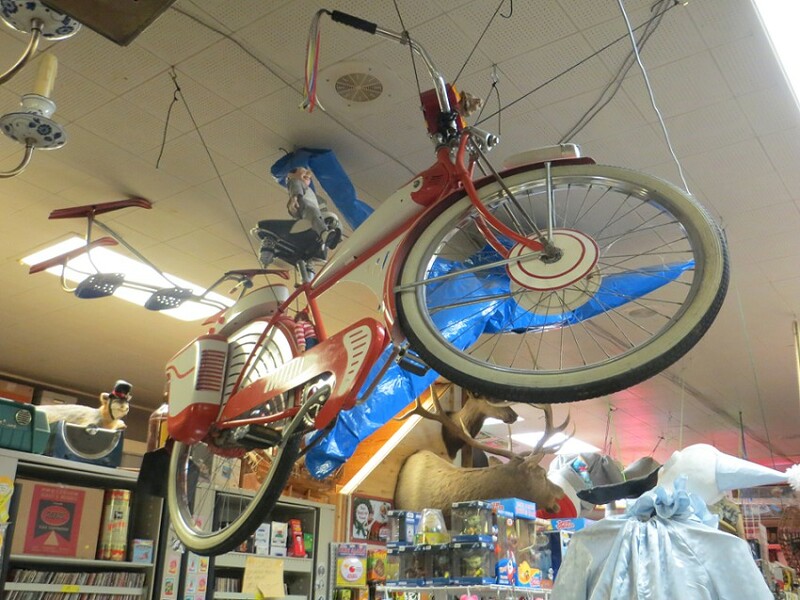 There was, however, Pee-Wee Herman's bike. As you can see, I only took a few pictures of the shop, but had I been less self-restrained, it could easily have turned into me doing photo inventory of the place for Ziegler. 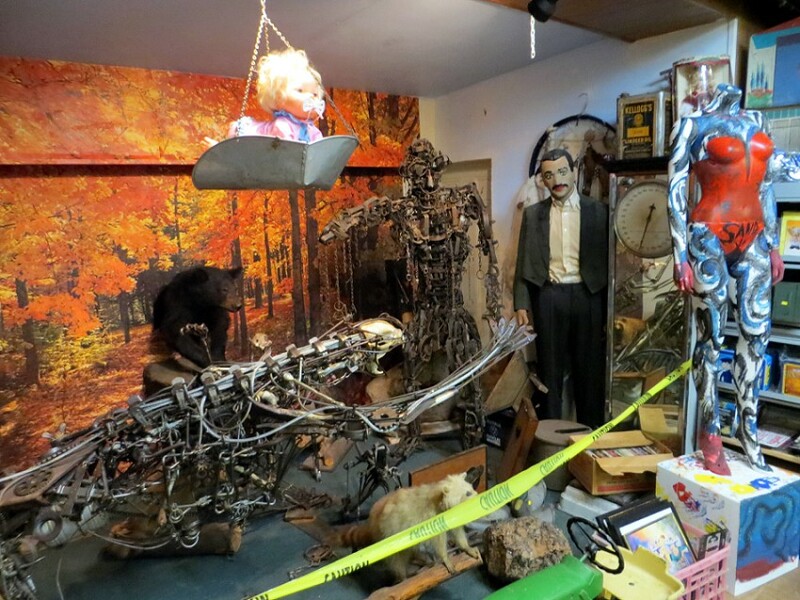 If you’re ever in the area, it’s well worth a stop, well worth hanging out, well worth talking to Ziegler, well worth throwing some money down, and—if they ever open the funhouse—well worth sneaking in and setting up a hidden living space somewhere on the property. Every other photo in this piece has a clown in it. Counting the first one.